Are You Brave Enough to Lap the Ascari Track in a Self-Driving Audi RS7? That means trusting your life to a computer. 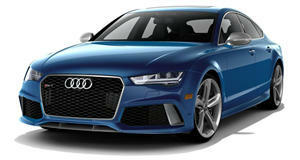 This isn’t the first time we’ve been shown Audi’s , a self-driving Audi RS7. Officially called the RS7 Piloted Driving concept, it’s clear the German automaker is pursuing autonomous driving to an even greater extent these days. Simple roads have become boring. It’s time to head to the track. And sure enough, this self-driving RS7 functions amazingly well. But is it capable of going around the Ascari track in Spain faster than if it had a human driver at the wheel? Auto Express was invited to do an experiment: Do a lap in a standard RS7 and record the time. Then, with an Audi technician (insurance purposes), hop in the Piloted Driving concept and just sit back and let the car do the rest. So is the concept capable of doing a faster lap on its own? Check out the video to find out.